Vanillekipferl (vanille means vanilla and kipferl, from Hungarian kifli, means crescent), are Austrian / German crescent-shaped cookies, coated with vanilla sugar. They originated in Austria, symbolizing the celebration of the victory of the Hungarian army over the Turkish in one of the many wars between the nations. You can also find them in many other countries such as Germany, Hungary and otheer Eastern European counties. Vanillekipferl are very similar to the Greek Kourabiedes, the only difference being the kind of butter used in Greece. First of all, I start a couple of days before and blanch the almonds. As I need to grind them in order to bring them to the consistency of almost almond meal, I put them on kitchen paper to dry. The drying period will depend on how humid it is. It may take about 2 – 3 days. I then put them in a food processor together with some flour in order to powder them. The remaing procedure is very easy. I use my stand mixer and beat the butter and icing sugar on medium high, until creamy. I then reduce the mixer speed to the lowest and add the remaining ingredients. At the end the mixture looks crumbly, as if it needs more moisture. If you press this mixture with your fingers you will see that it holds together. Cut some cling film and put the crumbly mixture there. Form it into a cylinder and wrap it in the cling film. Refrigerate it for at least half an hour so that the butter will harden again. Unwrap the cling film and cut round slices about 1.27 cm / ½ inch wide. Cut each round slice into two equal pieces. Then you have to shape the cookies. Be careful as the cookie dough is very fragile and may fall apart when shaping them into crescents. While shaping them, I discovered that wetting my fingers, I used blossom water but you can use water if you like, I could easily shape them. However, blossom water adds a lovely flavour as well. The baking time will depend on the size you make them and your oven. They usually take 12 – 15 minutes or until they become slightly golden. Like all cookies, when you take them out of the oven they will still be soft but as they cool, they will harden. They should rest for a few minutes to harden but while they are still warm, prepare some icing sugar with vanilla and coat the cookies. The cookies are crispy and delicious. They are medium sweet, so if you want them sweeter you can add more sugar in the cookie dough or coat them twice with the vanilla sugar. Create more of these delicious and festive cookies that make perfect gifts for friends and family! 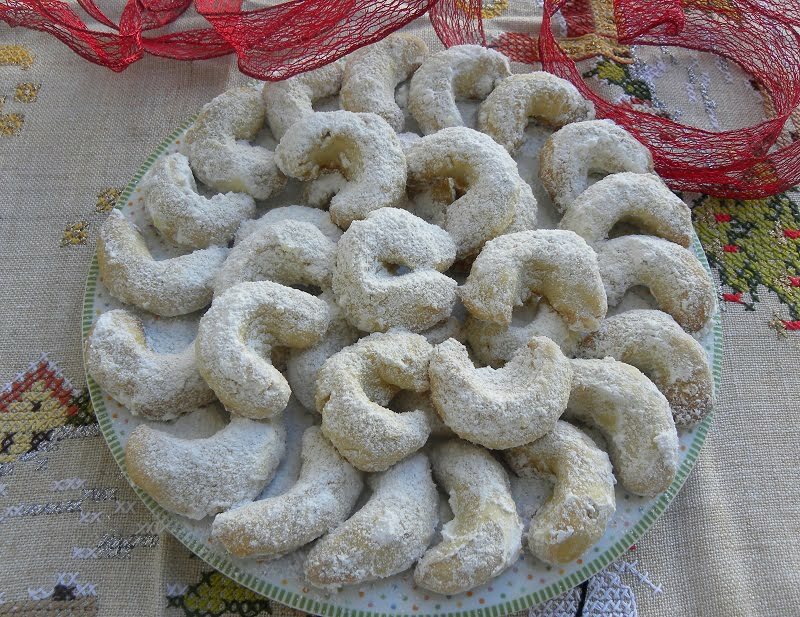 Vanillekipferl are cookies which originate from Austria and can be found in many other countries such as Germany, Hungary and otheer Eastern European counties. See how to blanch almonds. Put the almonds with part of the flour in a food processor and process until the almonds are powdered. Attach the K paddle to your mixer. Beat the butter and icing sugar on medium high, until creamy. Reduce the mixer speed to the lowest and add the almond-flour mixture. Add the vanillin and mix. Stop the mixer and scrape the sides of the mixer. Continue by adding the flour, until the dough looks crumbly with small pieces of pea-sized bits in it. Lay a piece of cling film on you working surface and taking pieces of dough press it with your fingers until it holds together into a dough. Continue with the remaining. Form it into a cylinder and wrap it in the cling film. Preheat the oven to 180o C.
Wet your fingers with the blossom water and shape each half into a crescent. Put them on a tray lined with parchment paper. Bake for 12 – 15 minutes or until golden yellow. Remove from the oven and set aside for 5 minutes, to slightly cool. Sieve the icing sugar and mix in the vanillin. While they are still warm, put them in the icing sugar to slightly coat them on both sides.